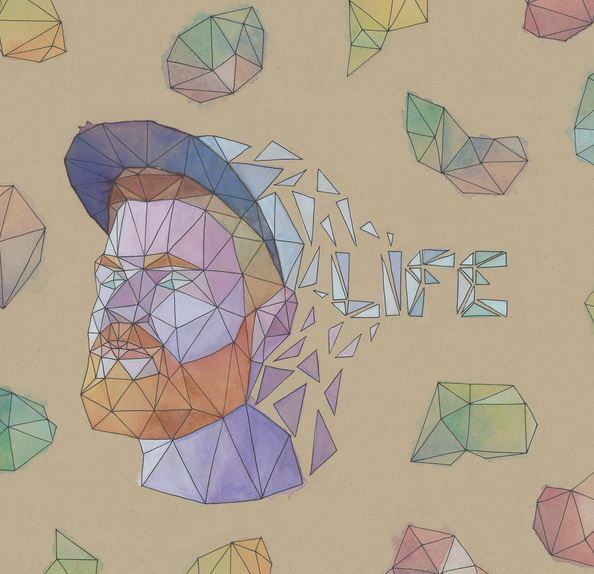 I wasn’t sure what to expect at all from Mike Water’s debut EP, called LIFE. The cover art was a little esoteric and abstract, so I certainly wasn’t expecting the opening track to be so upbeat and approachable. “Daisy” started with bright guitar, simple drums, and a catchy whistling bit for the chorus. Right away I thought Mike’s voice sounded a bit like Daniel Bedingfield, blended with a little Ed Sheeran, and tied together with some cheeky boy-band attitude. Next came “Gambling Man”, a song in a slightly deeper register than the first. This one seemed a little -richer and more balanced, with piano adding earthiness and depth – yet still positive and pop-y in tune. The vocal harmonies and piano background reminded me of Five for Fighting – remember that guy? For a few more throwback references, I’ll add that here Mike’s voice is similar to Third Eye Blind (on their mellow songs) or the guy from Filter. The buoyant vocal style is balanced with heavier lyrics on this track – Mike is covering serious emotional territory here, with lines like ” Sometimes I need a drink before I sleep; I can’t keep my mind from running deep / I’ve got lot of secrets I can’t share / Please don’t stay away, please don’t be scared.” Somehow it all fits together and sounds pretty good! Every now and then you might catch a little bit of an Australian accent peeking through, with a slightly nasal and direct tone to Mike’s relaxed and clear way of singing. The songs touch on some sad-ish topics and deep feelings, but they never feel bogged down or depressing. Overall this is a refreshing little break from some of the slower, heavier fare out there – something entertaining and positive in tone to have playing in the car, the shower, the house – anywhere you’d like to imagine yourself humming along and tapping your toes to something catchy. I was really intrigued by the press info that said Mike had a normal-guy 10-year professional career while writing all of these songs – this is something I can relate to (for better or worse, I’m still rooted in the corporate world) so I tried to find him on LinkedIn to no avail. I guess I’m glad he found his voice and eventually broke free to the newfound LIFE he wanted to show to the world via this EP. I think his music has very wide appeal, and he’ll probably get a fair shot at the music business – if he keeps putting out pleasant records like these in the future. *Photo not taken by RMC – image copied from album art as presented on http://www.eartothegroundmusic.co with the original posting of this music review, published August 16, 2015. Press the play button on Neil Holyoak’s release Rags Across the Sun and right away, you’ll be pulled into sounds of something something warm and familiar, giving you a wistful yet free “arm-out-the window-on-a-country-drive-in-the-summer” kind of feeling. Imagine a fresher, livelier version of Townes Van Zandt, and his would-be protégé M. Ward; sprinkled with the occasional pedal steel sound thrown in for a country feel. Neil sings calmly with a mellow and sometimes deadpan delivery – self-admittedly influenced by “teenage heroes” Belle and Sebastian (see bio on his website), sounding a little bit like Iron & Wine but with a voice that is less breathy and more whole, more vintage, more round and full. Sometimes there’s even a hint of a young Neil Young sound and even style peeking through. Each song is a bit different from the next; some are more simple and stripped down than the rest – with delicious names like “Sidereal Sunrise”, “Fancy Moonlight”, Silvery Skies”, and “Red Queen of Autumn”. Neil’s bio also mentions he was inspired by the Smiths – and the honest, straightforward lyrics certain reveal the same sort of vulnerability that is vocally and verbally thrown to the wind by Morrissey (while sounding completely different, of course). This seems so mature and introspective for someone who looks so youthful in their promo photos online (http://www.neilholyoak.com/). From Neil’s bio you gather that he has run into some hard times as a young kid – perhaps this contributes to his ability to really dig deep as a songwriter, and create something you can really experience and feel. Knowing that he spent his formative years in Montana conjures images of big sky and lonely open spaces just begging to be filled with art, experience, and of course music. Now he is Montreal-based, so if you are taking a reflective weekend trip to that part of Canada you should see if you can catch one of his shows. The album features great rhythms that never drag, a smooth voice that never irritates, pleasant musicianship featured in nice quiet instrumental sections that never stretch out too long – the style of each song seems somehow timeless, as thought it could have come from 50 years ago while still being appreciated today. This is definitely on my list of some of the best music I have heard all year, and I know I will be looking for this album to comfort and inspire me for many listens to come. 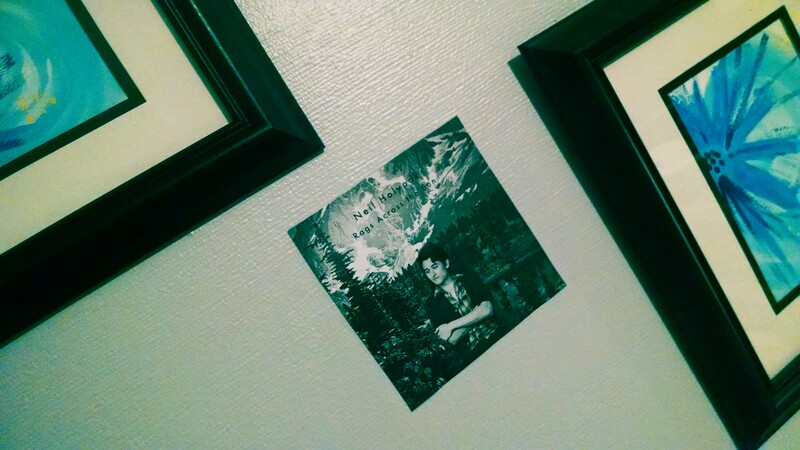 *Review originally posted on http://www.eartothegroundmusic.co on August 9, 2015. When you check out a new release by yet-another singer-songwriter, there is always the challenge of how to describe this new artist in contrast to the rest. There is usually something different, but it is sometimes embedded deep within the music, and may be hard to find. Looking at an artists’ website while previewing their music is one of my favorite ways to get started – you learn something more of the person who is creating this work, and this gives you a starting point for interpreting their songs and determining their unique element. My heart warmed when I noticed on www.vincentcolbertmusic.com that Vincent was based in Ann Arbor. I myself grew up in this area, and for me that part of Michigan is filled with so many happy memories, and much friendship. It breaks my heart to learn that Vincent struggled with loneliness and sadness while in this place that I love so much – but without going through this time of melancholy, Vincent would not have been inspired to write and release this new 5-song EP. 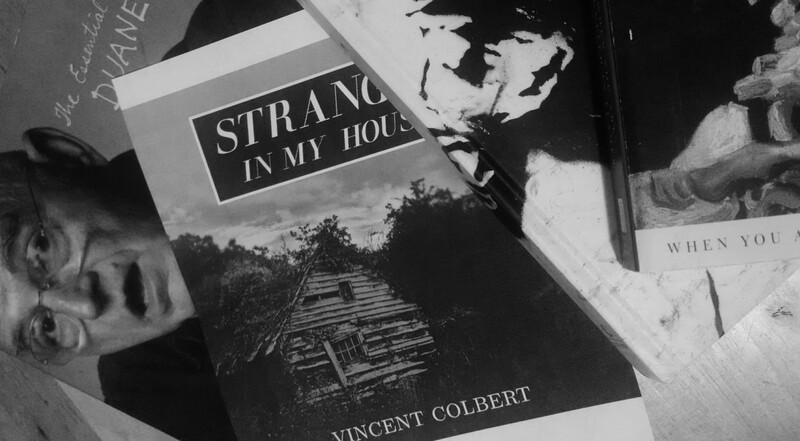 The title Stranger In My House sets you up for this feeling of alienation that comes through in the album, even in the cover artwork of a creepy shack that looks like a Dover Edition Paperback of spooky stories. As I started on the opening track, I was looking for a bittersweet tone and expressions of personal pain in the music – and I realized that Vincent’s appeal is something classic and poetic, a bit like Leonard Cohen. He’s not one of those singer-songwriters that is borderline bluegrass, or neo-folk. He’s just presenting his work in a bare, essential, and yes – classic way – to what is hopefully a new crowd of listeners looking for raw beauty and authenticity. The opening song “Baseline” keeps time with a wooden clapping sound, almost like a metronome turned up extra-loud. It gets a little grating as it continues through the song – but thankfully later blends into the lovely chorus so you forget about it for a few seconds. It is presented in an echo-y, vintage-y style of recording that helps feature Vincent’s beautiful yet relatable voice. He sounds rather like my favorite singer from The Head and the Heart, on emotional songs like “10,000 Weight In Gold”. As I listened to Vincent singing “Hold on, we have come on hard times / I think I hit the baseline”, I noticed that the overall effect of this song is very basic and elemental – like you are in a small room with a friend who is performing just for you. I mentioned Leonard Cohen earlier, and while Vincent’s voice is deep, it is not quite as low as Leonard’s – there is a brightness there that sometimes breaks into an energetic vibrato à la Conor Oberst. The overall effect is mellow, smooth, and warm. Track #2 opens with guitar arpeggios that seem immediately familiar, and the tempo picks up intermittently with good train-track drums jumping in and out. If you like some Nick Drake songs, you might like this one too, as Vincent proclaims “I don’t waste time filling space with empty words”. The next song (“As You Are”) is slower, yet still low, rich, and full of emotion. The recording style again seems bare, which supports the theme of loneliness on this album. There is a lot of that scratchy sound that is so intimate – the sound of fingers moving on strings, up and down the neck of the guitar. The title track is next, and it explores even deeper into darkness with a confession – “I don’t know what to pray, I don’t have the right words to say”. The chords here are less upbeat in feeling, but the listener may be a little surprised with creative transitions on the chorus (which also features great vocal harmonies, filling in around Vincent’s lead). If you can remember the 90s, maybe you recall “Heaven” by Better Than Ezra? This song evokes a lot of the same emotions as “Heaven”, via both musical and lyrical means. The EP fittingly ends with a track called “Closing Hymn”. The lyrics suggest deep memories, a delusional past, and disenchanted present. Again the religious imagery in this song reminds me of Leonard Cohen (think “Hallelujah”) as Vincent sings above an appropriately hymn-like chord structure: “Praise The Lord, was the closing hymn”… There is a lovely piano solo on the bridge, before Vincent’s voice sings out strongly one more. I can see this EP as a collection of songs that would appeal to someone in a time of loneliness or transition – someone looking for understanding, empathy, support, and a special song they can make their own. Personally I prefer songs that are more built-out, musically fuller in instrumentation, and more positive in tone. But if you pack this EP away for a big change that you are making independently – or even for just a rainy weekend when you’ll be alone with your thoughts – you just might find something in Vincent’s consoling voice that will speak to you.